Here’s a prank that would make anyone’s hair stand on end. Most if not all of us are deathly afraid of spiders. I don’t know if it’s the fact that they’re venomous, even though only a few of them are, or that they just look so creepy. 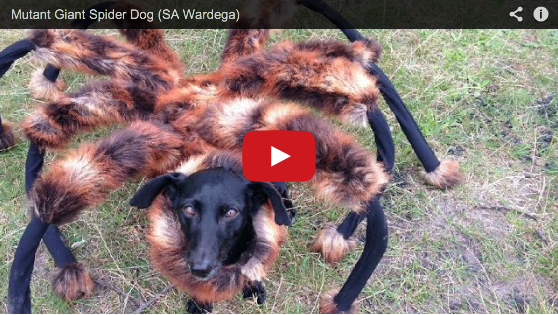 Well the people over at SA Wardega decided to prank people by dressing a dog up as a giant spider! The reactions were priceless. The video starts out with this really creepy intro of this deformed guy setting the “giant spider” free. It then gets its first victim as the guy opens the door and then runs out. Next they put the spider in a elevator with someone underneath it so it looks as thought the spider was killing him. Next a couple walking through the park notice a guy hanging from a tree in what looks like spider webs. 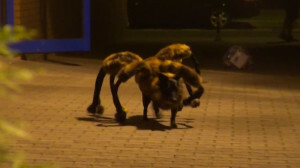 The spider then leads chase on them. The last guy is walking though an alley and notices a bunch of severed limbs hanging from spiderwebs, not that spiders could have the ability to cut off limbs or anything. The “spider” then comes from the other side chasing the man into a spiderweb trap. The whole thing is hilarious and a great idea. I don’t know what I would do if this happened to me.. probably freak the hell out and die. Check out the prank below.